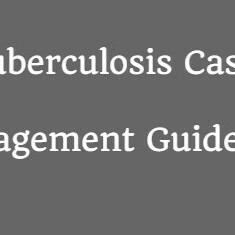 The guideline is prepared with the aim of making easier to health worker to find out the solution quickly when they feel confusion while dealing with a suspect or a confirmed TB patient. Target Groups: Health Workers and Doctors working in TB. History and Examination, Diagnosis of tuberculosis, prescribing the Treatment Regimen Correctly, Educating the Patient, Choose the Best Treatment Supporter, Follow-up the Patient at the Sub/Treatment Centre, Ensuring Quality and International Standards for Tuberculosis Care.